“I’m going to need $100 dollars from each of you,” said medically retired Cpl. Kyle Carpenter with a chuckle. Humor is how the next Medal of Honor recipient opened a meeting with reporters last week at the Pentagon ahead of the White House’s announcement that he will become the second of only two living Marines to receive the nation’s highest valor award for fighting in Afghanistan. 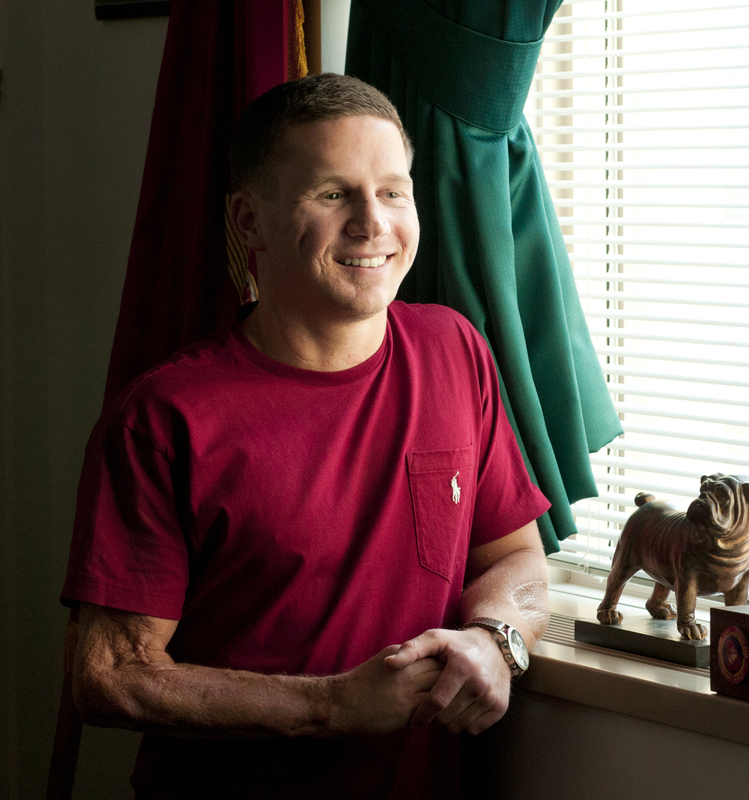 He sat down with us to discuss the White House’s announcement, the events of the day he covered a grenade with his own body to save a fellow Marine, his road to recovery and his plans for the future. Many of his comments were inspiring, even tear jerking, about the incidents of Nov. 21, 2010, when Carpenter — who deployed with 2nd Battalion, 9th Marines — used his body to absorb the blast of a grenade that was thrown into the roof top position he shared with another Marine. But Carpenter first and foremost maintains a sense of humor. He is always ready with a quip. Regarding the specifics of his injuries, he grinned and told another reporter there wasn’t enough room in a single notebook. His inherently positive attitude is one of the more striking traits, as if it’s important he leave a mark on everyone that meets him. He loves the Corps, God, family and country. And now that his recovery is complete, he said, he wants to finish a degree at the University of South Carolina – possibly in psychology – and help others. We’ll have a full Q&A in Monday’s edition of Marine Corps times, but here are some of the most memorable excerpts from our sit down. Carpenter, still just 24, said during the interview at the Pentagon and in the following Marine Corps-produced video, that he is just getting started. The consummate optimist, he is always looking forward. You know what, Kyle? I bet your Mom and entire family are so proud of you! I am too! I wish you God’s blessings and thank you for being a hero! Some folks don’t like this word – but it is all meaningful. To save others – is a true hero. I pray you enough. xxoo, Iris (Mom of a Navy CMCPO – a female!). Heal quickly – inside and out. You, my friend, are a stud! Freaken awesome brother. The highest respect. Honor, courage, commitment; you are a remarkable example of our core values! Semper fidelis Marine! A truly worthy hero for the Medal of Honor. Kyle, you are the walking definition of Devil Dog! Semper Fi, Brother! Kyle, I thank God for your amazing courage. Thank you!!!!! Kyle, the Lord has better things for you. We are proud of what you have accomplished and all that you stand for. You are a proud American. We are proud of you. Simper Fi. BAND OF BROTHERS Kyle. Semper Fi, enjoy life. You’re tougher than I could ever hope to be. Kyle, my husband (a MSgt) and I read your interview in the Marine Corps Times and were so impressed. Thanks for representing the Marine Corps so well. The article was in exactly the right issue of the paper, too – right next to Gen. Mattis and Gen. Kelly making the point that combat can make Marines even better men, not “damaged goods.” You absolutely exemplify that. God bless you.